So after 2 full days of gluttony and eating almost every waking second, we ended up at Hoi Tong for another 10-course meal. 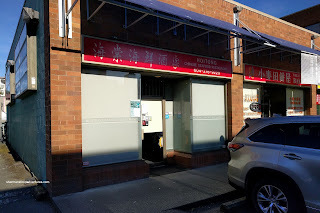 From the outside, the restaurant looks nothing more than a small hole-in-the-wall Chinese joint. However, there is more than meets the eye... no not like Transformers. 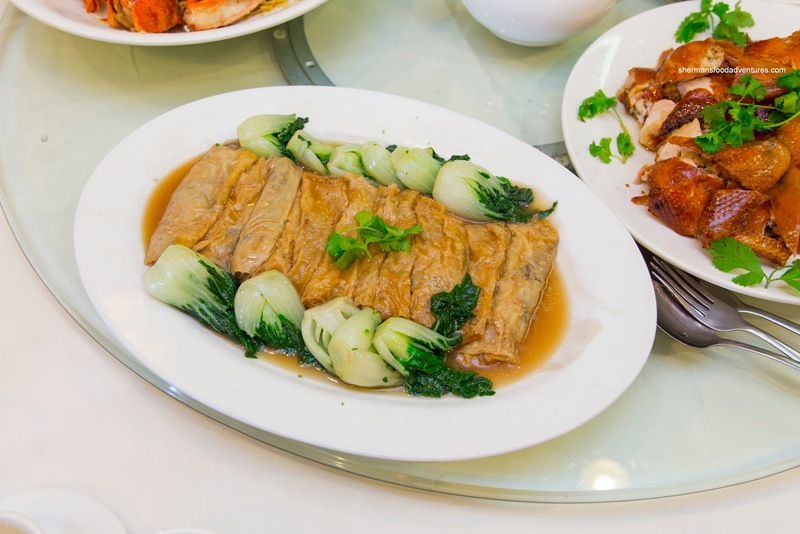 Inside, one will find a tidy little spot and at the helm, 72-year head chef and owner Leung Yeau Tong dishing out fantastic food. Normally, one won't get a table unless with reservations. 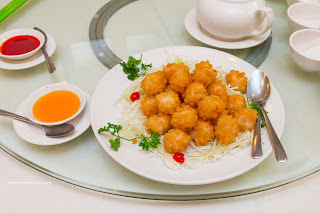 That we had and were started off with the Fried Shrimp Balls served with sweet & sour sauce. Coated in small cubed bread crumbs, the exterior was lightly crunchy giving way to meaty whole shrimp filling. There was a firm snap and chewiness to the shrimp while the natural sweetness really came through as well as an appealing brininess. This reminded me of shrimp toast, a dish sometimes found at Cantonese Dim Sum. 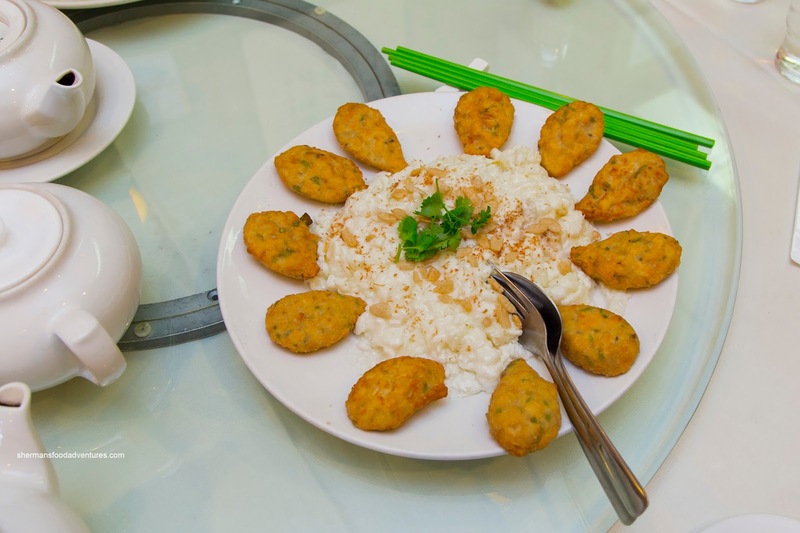 Continuing on appetizers, we were presented with the Da Liang Fried Milk with fried tofu nuggets. Silky and creamy accented by the lightest of chew, the fried milk was well-balanced in texture and taste. As for the tofu, it was firm with a rebound texture while sporting mild seasoning. Onto the next course, we had the Fish Maw & Crabmeat "gung" or stach-thickened soup. Sporting the desired viscosity where the broth was silky and just thick enough to coat a spoon, there was a considerable amount of tender (while not melting) fish maw and fluffy crab. I found the flavours to be mild with only a background sweetness. A few drops of red vinegar helped livened things up. 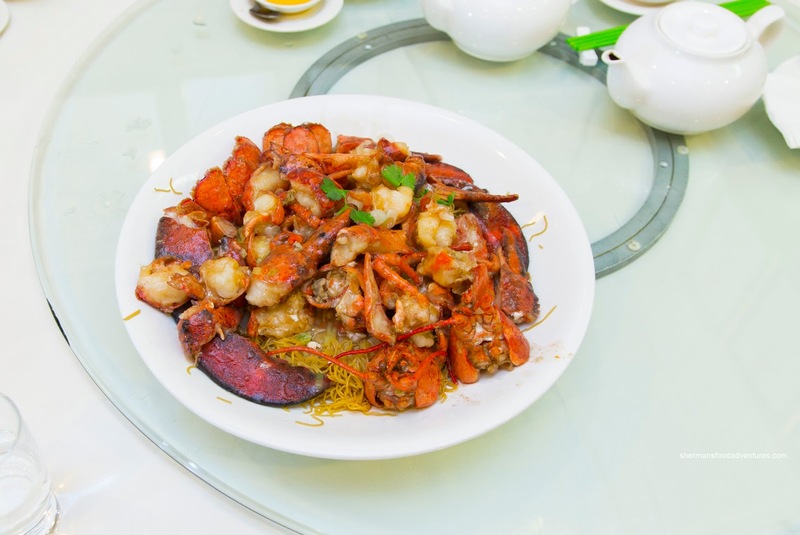 Majestically plated atop al dente egg noodles, we were treated to Double Lobsters wok-tossed in a consomme sauce. 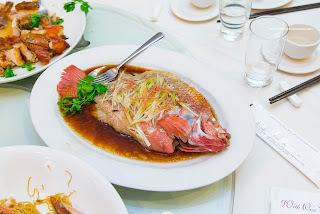 As much as this is a pretty common dish for a Chinese multi-course banquet meal, I found this one to be expertly- prepared. Exhibiting the desired meaty bounce texture, the naturally sweet lobsters were complimented by the salt in the consomme. Glistening in a beautiful golden brown hue, the Crispy Salt-Baked Chicken was really on point. In addition to the crispy and well-rendered skin, the meat (both white and dark) was succulent and moist. 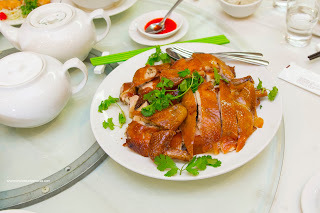 Although the whole chicken was prepared with wok salt, the dish was not overly salty. Rather, it was aromatic with as smoky salt finish to go with the natural sweetness of the chicken. Okay, normally Sweet & Sour Pork doesn't make it onto meals such as these, but this dish was elevated with the use of pork cheek. 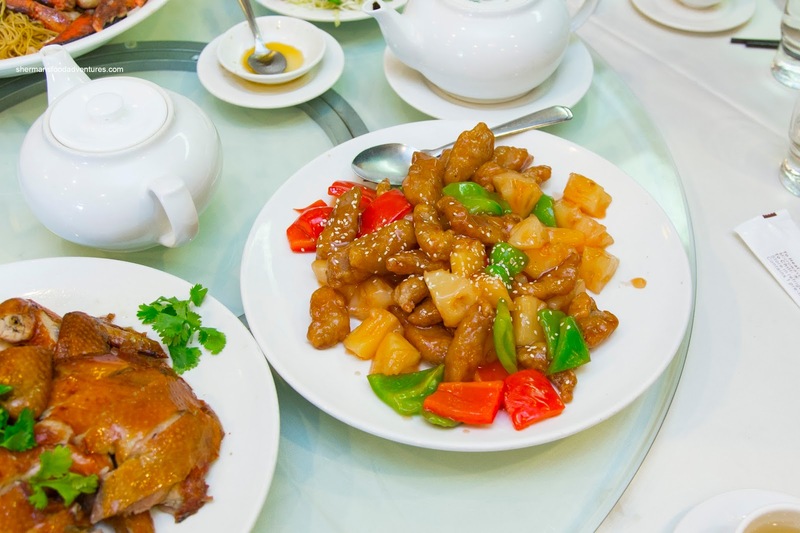 As a result, the crispy pieces of meat sported a chewy rebound texture that was still succulent. With just enough sauce to coat each piece, the flavours were balanced between sweet and tangy. From 2 straight meat dishes, we had a vegetarian one in the Shiitake Mushrooms Stuffed in Bean Curd Skin. 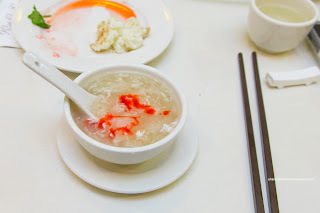 I loved the texture of the bean curd skin as it was buttery soft while still exhibiting a soft chewiness. Inside, the mushrooms were well-seasoned with a tender chewiness. I found the sauce to be just salty enough to flavour the dish including the crunchy baby bak choy. For the second straight night, we were served a Steamed Red Tilapia. Similarly to Vivacity, this one was steamed expertly where the large fish was flaky and moist. That was quite the achievement as tilapia can often be mushy. Finishing everything off was the usual sweetened soy with ginger, green onion and cilantro. Ending the meal off was not the typical fried rice. 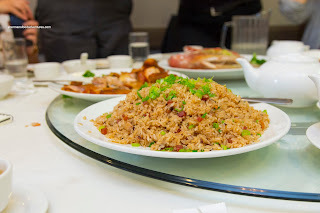 Rather, we had Wok-Fried Sticky Rice instead. Great, something even more filling than just fried white rice! Hey, I still ate it because the execution was on point. 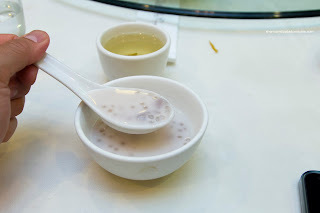 Each chewy grain of rice was discernible from one another and the entire dish was not overly greasy. I liked how there was just enough seasoning where the cured sausage and dried shrimp still stood out. For dessert, we were presented with the Sweet Taro & Coconut Milk Soup with tapioca pearls. This was surprisingly light and not very sweet, hence, the aromatics of the coconut milk and taro were at the forefront. This meal concluded our 2 days of gluttony exploring hidden gems and hole-in-the-wall establishments in Richmond. Hoi Tong definitely fit that criteria as it offered up beautifully executed Cantonese food in a little shop tucked away in one of the many strip malls in Richmond.